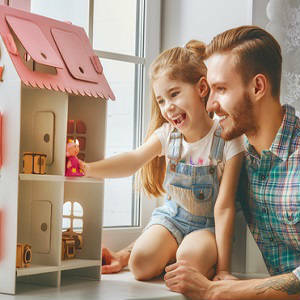 Most Affordable Dollhouses of 2019 - Check Out Our Top 9! Surprisingly, the most expensive dollhouses are usually not the best dollhouses for most families. Most parents are looking for a fun dollhouse that inspires their child’s imagination. We’ve taken the time to find the best 9 affordable dollhouses for sale today. If you’re looking to save some money on a quality dollhouse, check out our favorite choices below. For over 30 years, Melissa & Doug has been a toy brand that parents can rely on for quality and durability. This affordable dollhouse is no exception. The Melissa & Doug Take-Along Wooden Doorbell Dollhouse is a fun and unique option for older toddlers/younger children (the dollhouse is recommended for ages 3-5). True to Melissa & Doug form, this dollhouse is designed to be educational AND entertaining. The home has four locking doors, and four separate keys to open them. The doors and the keys are numbered, helping your toddler learn numbers and association. The Melissa & Doug Take-Along Wooden Doorbell Dollhouse is designed to be “taken along”, with built-in handles for easy carrying. Plus, weighing in just over two pounds, your young child will have no problems picking this dollhouse up and taking it with them. This dollhouse is small at 9 x 7 x 7 inches. Four functional doorbells – Ding-dong! The Melissa & Doug Take-Along Wooden Doorbell Dollhouse is our top pick for affordable dollhouses under $50 for young children. At this price point, it’s hard to find a quality dollhouse that’s also fun to play with – this Melissa & Doug dollhouse is both. Perfect for young toddlers (ages 1+), the Fisher-Price Little People Big Helpers Home offers a surprising amount of features for a dollhouse at this price point. This Fisher-Price dollhouse is an interactive dollhouse, meaning that it has buttons that play sounds, sing songs, and even turn on the lights. Your young toddler will have fun pressing the buttons, while also learning sound associations (i.e. toilet “flushing” in the bathroom). This affordable dollhouse encourages teamwork. Your child will love helping Jack and Emma (the two included dolls) put away toys in the toy room, clean up the kitchen, and even give the dog (also included) food and water. The sides of the Little People Big Helpers dollhouse also swing open, allowing multiple kids to play with the home at the same time. The dollhouse is decent size at 28 x 6 x 16 inches. The Fisher-Price Little People Big Helpers Home is a great economical choice if you’re the parent of a young toddler. Although only rated for kids 1-5 years old, many parents reported that their older kids also had fun with this dollhouse. A relative newcomer to the dollhouse market, Kubi Dubi is on a mission to help reduce/eliminate screen addiction for kids. Rather than an hour of iPad time, they’d rather provide kids with simple “no batteries needed” fun. This affordable dollhouse is built from high-quality solid wood. Kubi Dubi also takes pride that the wood is NOT imported from China and contains no chemicals or paint. The neat thing about this dollhouse is that some simple assembly is required to put it together. They’ve designed it so that young children (with some help from mom and dad) will be able to build their own dollhouse. Your son or daughter will be so proud of the dollhouse they helped put together. Once assembled, the overall dimensions of this dollhouse are 15 x 5 x 12 inches. We chose the KUBI DUBI Wooden Dollhouse DIY Kit as an alternative for parents that want a simple, distraction-free dollhouse. If you’re looking for a budget-friendly wooden dollhouse for your older son/daughter, this could be the right option for you. Slightly bigger and less interactive than the Melissa & Doug Take-Along Wooden Doorbell Dollhouse above, this portable mini dollhouse is both fun and durable. Designed for smaller spaces, this wooden dollhouse swings open when in use, and folds up for compact and easy storage. This dollhouse comes with two flexible wooden dolls and 11 pieces of furniture – bed, table, chairs, and even a TV. If your daughter talks you into sitting on the floor and playing dollhouse with her, you’ll be impressed by the attention to detail that went into the design. From the working front door to the sturdy carry handles, this economical dollhouse was built to last. When closed, the dollhouse is 12.5 x 7.5 x 10 inches. For the price, this Melissa & Doug dollhouse offers a tremendous value. Most dollhouses at this price range do not come with any furniture or accessories. If this is your daughter’s first dollhouse, the Melissa & Doug Fold & Go Wooden Dollhouse is a great option since it comes complete with all the toys she would need to play. It’s unusual to find a Barbie dollhouse, such as the Barbie Dreamhouse, for under $200. To find an official Barbie dollhouse for under $100 is almost unheard of. If your daughter has a Barbie doll collection (no matter how big or small), the Barbie Pink Passport 3-Story Townhouse is definitely worth checking out. Although this dollhouse isn’t as big as some of the other Barbie dollhouses, it’s designed to that it feels bigger than what it is. One example of this is the rooftop lounge, adding another play area to the four classic rooms on the inside. This affordable dollhouse also swings open, allowing multiple kids to play at the same time. Furniture and other accessories are also included with this dollhouse, making it a fairly all-inclusive purchase if you don’t have other dollhouse furniture large enough for Barbies. The overall dimensions are 7 x 16 x 29.3 inches. The Barbie Pink Passport 3-Story Townhouse is one of the only choices if you’re looking for a budget-friendly Barbie dollhouse. If you’re a child at heart, you’ll love playing Barbies with your child with this fun dollhouse. Fisher-Price offers several terrific options for your child’s first dollhouse, and the Fisher-Price Loving Family Dollhouse is no exception. Your child will love the four different play levels, and you’ll love the budget price tag. The six spacious rooms can fit tons of furniture, dolls, and accessories (perfect if your child already has a small collection started). This dollhouse also has some fun interactive features, such a working doorbell, that most dollhouses in this price range don’t include. It’s important to note that this dollhouse does include some small pieces, so it’s only recommended for kids ages 3 and up. When folded shut, this dollhouse is 29 x 32 x 40 inches. Overall, most parents were very happy buying the Fisher-Price Loving Family Dollhouse for their kids. If you think you’ll need the extra playroom for several siblings/cousins/friends to play at once, this economical dollhouse is worth checking out. Melissa & Doug has, again, made our list of high-quality affordable dollhouses. Known for their quality and dependability, the Melissa & Doug Fold & Go Dollhouse is no exception. This dollhouse is similar in design to Melissa & Doug Fold & Go Wooden Dollhouse above, but is a larger and more gender neutral option (if you’re looking for a dollhouse for a boy). The neat part of this dollhouse is the attached garage, complete with a working garage door. When not in use, the dollhouse folds up for easy storage. At almost 7 pounds, it’s not too heavy for kids 3 years and older to move this dollhouse around (easy-carry handles included). This Melissa & Doug dollhouse comes with 11 pieces of gender-neutral furniture and two wooden dolls. If you’re looking for more accessories for this dollhouse, extra doll family members are available for purchase. When shut, the closed dimensions of this dollhouse are 16 x 11.5 x 10 inches. The Melissa & Doug Fold & Go Dollhouse is a potentially fun DIY design project for you and your child if you decide to decorate the plain wood home. Either way, most parents (and kids) were very happy with this budget-friendly dollhouse. The KidKraft Penelope Dollhouse proves that sometimes bigger really is better. This affordable dollhouse is tall enough to fit Barbies and other 12-inch dolls, yet not so big to take up the entire playroom. Rather than built out, this Kidkraft dollhouse is built up, standing 44 inches at its tallest point. The three-level design is well thought out with four completely different rooms – a bathroom, kitchen, living room, and bedroom. The Penelope dollhouse comes with some fun features, including a curved staircase connecting the living room and bedroom. It also comes nine larger pieces of furniture, making it a good option if you’re looking for a Barbie Dreamhouse alternative. The assembled dimensions are 25.5 x 13 x 44 inches. You’ll be surprised at the size and quality of this affordable dollhouse. The KidKraft Penelope Dollhouse is a very solid choice for your child (and you’ll probably have fun playing with it too). If the Penelope dollhouse above is too big for your kid’s dolls, the Best Choice Wooden Cottage Uptown Dollhouse may be a better option. The floors on this dollhouse are shorter, so dolls under 7 inches tall are best. This budget-friendly dollhouse is unique in its four-level design. The bottom level is a three-car garage, and each level has a ladder connecting it to the floor above. At this price range, it’s unusual to see a dollhouse with this many rooms (six total plus a rooftop balcony). This Best Choice dollhouse comes with 13 total pieces of furniture, including a bathtub, stove, and even a piano. Your child will have hours of fun role-playing with their doll family in this dollhouse. The overall dimensions are 24 x 12 x 32 inches. If you like the durability of a wooden dollhouse, the Best Choice Wooden Cottage Uptown Dollhouse is a good affordable option. Other parents (and their kids) were very happy with the quality and fun design of this economical dollhouse. As you’ve seen above, a smaller budget doesn’t mean you have to sacrifice on the dollhouse you buy for your child. 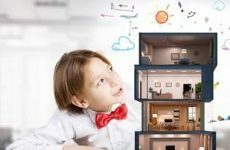 Based on personal experience and reports from other parents, the nine dollhouses above are the best affordable dollhouses we’ve found. If you’d like to see some other budget-friendly choices, check out the full selection on Amazon by clicking here.